Os grid reference: approx. SD 792 283. On Hyndburn Moor between Huncoat and Dunnockshaw, Lancashire, is the now rather forgotten Mary Hoyle Well, a natural spring and former healing well named for St Mary the Virgin. It is also called ‘May Road Well’ on the Ordnance Survey map and ‘May Hole Well’ and, perhaps more locally ‘Mere Royde Well’. Today there is not much to see, apart from a thick stone-slab which has an inscription carved onto it that by all accounts is probably a recent addition. In the past pilgrimages and fairs took place here, usually on the first Sunday of May, but were also associated with the feast-days of the Blessed Virgin Mary in February, March, May, July and September, which the local Roman Catholic community held in great reverence. The well is located at the south-western side of Hameldon Hill, some 400 metres east of the King’s Highway, an ancient moorland road that links Huncoat with Haslingden; it stands beside a junction of moorland tracks, one of which leads to the east in the direction of Dunnockshaw, Clowbridge, Goodshaw and Loveclough. Mitchell’s Reservoir is just a little to the north-west of the well. Back in the 17th and 18th centuries the well was visited by pilgrims on the ‘feast-days’ associated with the Blessed Virgin Mary – at which time fairs were “also” held here at the beginning of May but, by the 19th century the fairs had stopped and veneration of the well was in decline. There were numerous reports of healings casused by the well water, which was quite deep down in the ground beneath the slab and was never known to dry up, even in times of drought. At some point in the 1970s the large stone-slab, recorded as being over 90 inches long, 50 inches wide, and 7 inches thick, was badly damaged and cracked in two; today this slab is only half its original size. The faint carved inscription on the stone says ‘Mary Hoyle Well’ and a cross has been carved onto it by some devotee – but these inscriptions are from fairly recent times – again probably the 1970s. The Accrington author Rowland Joynson in his book ‘Join Joynson’ published in conjunction with ‘Accrington Observer & Times’ tells us quite a bit about Mary Hoyle’s Well. Mr Joynson say that: “The water cannot be seen. It is piped from somewhere down beneath the erstwhile flagstone and emerges somewhere near the dam of Mitchell’s Reservoir. It is reputed never to run dry”. “Certainly around 1957 there was a great drought and much worry about reserves at Mitchell’s, but Mary Hoyle’s kept on trickling”. “There are all sorts of speculations about the origin of the name. It is generally assumed to have been the Mere Royd Well, but many ancient wells are associated with the Virgin, and Mary Hoyle does leave you thinking”. The author also speculates that the well is the original source of the Hynd burn “as the spring rising at the greatest altitude”. At one time, long ago, the well was the ‘most important’ source of the drinking water for the higher part of Accrington, according to Joynson. It now, apparently, flows underground into the nearby Mitchell’s Reservoir. Mary Hoyle Well is one of the places included in the book ‘The Holy Wells and Mineral Springs of N.E. 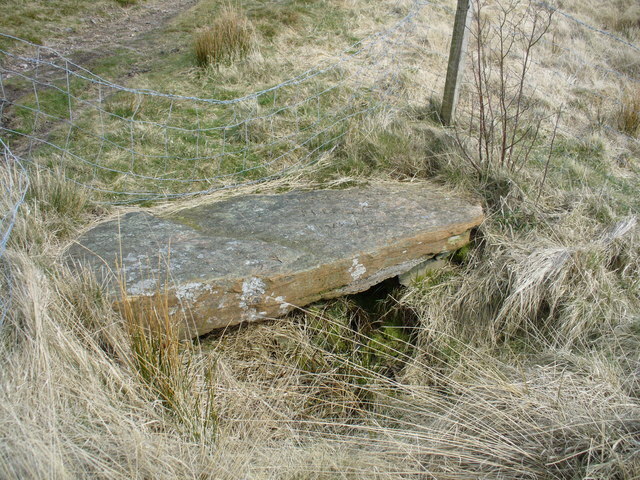 Lancashire’ by Clifford Byrne, where he mentions similar customs happening at Calf Hey Well at Cockden, Briercliffe, near Burnley, but there are many other wells and springs dotted about the area, many of them now largerly forgotten. Henry Taylor in his great antiquarian work of 1902‘The Ancient Crosses of Lancashire’ also mentions Mary Hoyle Well. Byrne, Clifford., The Holy Wells and Mineral Springs of N.E. Lancashire, Marsden Antiquarians, Nelson, 1982.
http://www.geograph.org.uk/photo/767569 © Copyright Peter Worrell and licensed for reuse under this Creative Commons Licence. Joynson, Rowland., Join Joynson, Clough & Son, Great Harwood, Lancs, England, 1975. Taylor, Henry., The Ancient Crosses of Lancashire, Richard Gill, Manchester, 1902. Categories: Holy Well | Tags: Mary Hoyle Well on Hyndburn Moor in Lancashire | Permalink.